Welcome to part two of our Portland City Guide Series. Now that you’re fueled up on coffee (did you try the torch-fired s’mores mocha at Water Ave?! ), let’s go shopping! One thing we love about shopping in Portland is that although there are quite a few local boutiques and shops, they all seem to have their own personality and offer a unique shopping experience. However, what makes shopping in Portland even better is that sustainability, eco-friendly style and supporting local makers is definitely high priority. Keep scrolling to browse through a few of our favorite places to shop in PDX. This bright and airy downtown boutique features lust worthy pottery, unique home goods, gorgeous jewelry and racks on racks of their houseline children’s and womenswear apparel (designed and crafted right here in PDX). From wondrous smelling soaps, candles and self-care products to artisan jewelry and more, whether you’re looking for something to dress your body, your home or your little one, you’ll find it at North of West. Welcome to MadeHere - a specialty shop dedicated to all things made and produced in Portland! While MadeHere doesn’t have a huge fashion section, it does carry some of our favorite accessory, lifestyle, food and self-care brands like Primecut (pictured below), Bridge Nine Candle Co and Claws Out. Its also home to apparel brand, Ginew (pictured below), the only Native American-owned denim collection! If color, cool prints and patterns are your jam, you’ll love The Yo Store! Curated by Sarah Radcliffe (who, in another life was a trend researcher and buyer in London), this colorful boutique is definitely a must-shop while in town. From a mix of vibrant vintage pieces to hand-selected ceramics, prints, jewelry (and more!) by indie artisans, you’re bound to find something fun and unique. Carefully curated, well designed clothing for every pronoun and every-body is what you’ll find at Portland’s newest boutique Monochromatic. Shop guilt-free knowing that every piece in this vibey shop was intentionally designed and ethically manufactured by small batch artisans and brands making it easy to shop your values. Located in the Alberta Arts District, Amelia is a unique boutique that offers vintage style with a modern twist. Designed and produced right here in Portland, Amelia’a houseline caters to sizes XS to 3X. Intentional, beautiful and airy are just a few words that describe Seaworthy’s new digs. Located in Portland’s Hollywood district, the design studio and showroom for jewelry designer Marisa Howard, is a spacious treasure chest of goodies. From the jewelry itself to the stands they perch on, this shop is a true extension of brand. Shop the swoon-worthy handmade jewelry in the front, or pop in back and catch the Seaworthy team in action soldering, welding, polishing and hammering metals to make new bling. Committed to supporting women artisans and local makers, Seven Sisters carries brands that are ethically and sustainably produced and primarily woman-owned. From apparel and accessories to self-care and beauty products, everything you’ll find in Seven Sisters has been hand-picked with sustainability and ethical practices in mind. 811 E Burnside St #111. If there’s one thing Portland is good at it’s collaboration, which is proven by The Ones Shop. An independent design collective, The Ones Shop is a collaborative between local designers Liza Rietz, Tiro Tiro, Revere, Sara Bergman Apparel and Marty Jean. Home to Portland Designer Holly Stalder, Haunt is a cozy studio/showroom/boutique full of colorful gems and fun prints. Located on the historic Hawthorne Boulevard you will find Altar, an alternative boutique that sells handmade women’s clothing, jewelry and more. Laced with the essence of nature and Northwest vibes, Altar offers an edgy and bohemian spin on quality hand made goods. Kiriko, 325 NW Couch St. Folly, 1005 NW 16th Ave.
Garnish, 404 NW 12th Ave.
EcoVibe Apparel, 1408 NE Alberta St.
Grayling Jewelry, 1609 NE Alberta St.
Button Consignment, 6517 N Interstate Ave. Gather Resale, 7400 N Lombard St.
Artifact: Creative Recycle, 3630 SE Division St.
Union Rose, 7909 SE Stark St.
One of the most common obstacles I hear about buying ethical fashion is that the price tag is too hefty for many budgets. It’s easy for bloggers to ‘lose touch’ about how expensive clothes are when we often have bigger-than-normal budgets for clothing and are often gifted items through brand collaborations. 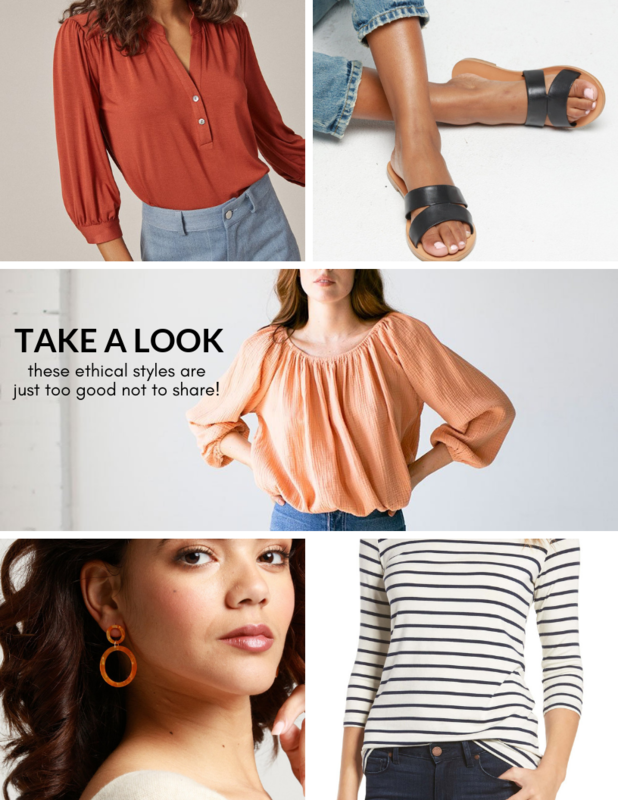 The problem with that in the ethical fashion blogging space is that we (I) start presenting ethical fashion as something that may not always seem attainable for everyone. While I do love following (often higher-priced) independent designers with a passion, I do believe ethical fashion is accessible to many budgets. There are many roads to an ethical closet, including loving and wearing what you already own, and shopping secondhand. But there are times you might be on the hunt for something new, or specific. I share a lot of Everlane on the blog; they’re known for their sleek designs and accessible prices. It’s no secret they’re a favorite of mine (you can see my picks here). But today I wanted to share some items from other brands that I’m loving too. 1 // Mylene V-Neck in Spice, Amour Vert, Made in the USA. $68 – Beautiful and drapey in the most gorgeous color. 2 // Rose Sandal, ABLE, responsibly made in Brazil. $98 – Slip on shoes in the summer are my favorite thing. These would look super cute with faded jeans, any sort of white dress and, of course, cut-offs. 3 // The Clara Blouse in Peach Bloom, Suunday, Made in LA. $86 – I have had this top in my cart more than once. I am a sucker for gauzy fabric and this color. 4 // Sorrento Earrings, ABLE, Made in Nashville, TN, USA. $48 – I’m a sucker for a simple statement earring. I love the color these would add to an outfit, especially my favorite staple, a white t-shirt. 5 // Francoise Stretch Jersey Top, Amour Vert, Made in the USA. $78 – Love this top so much. I plan to buy it when my thrifted version wears out. This list barely begins to scratch the surface of what’s out there. This compilation is inspired by colors, tones and shapes that I love. For further shopping see my Where to Shop page. Or check out my friend Leah’s. Andrea was a panelist at the 2018 Sustainable Fashion Forum. This article was first published on her blog Seasons + Salt. This post contains affiliate links, which means if you see something you like and decide to make a purchase, Seasons + Salt will make a small commission at no extra charge to you. Add these brands to your shopping list.